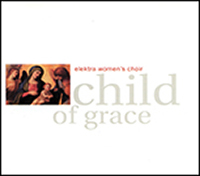 A collection of Christmas music from the 15th century to today, Child of Grace includes nine outstanding pieces by some of Canada’s best living composers. The program features a haunting setting by Knut Nystedt of Mary’s Song, a poem by Luci Shaw; beautiful a cappella singing in Adam Lay Ybounden; two arrangements of I Sing of A Maiden; and dramatic arrangements of traditional Christmas favourites like The Virgin Mary, The Huron Carol, and I Saw Three Ships. The featured work is Derek Holman’s energetic suite, Sir Christëmas. with Rita Costanzi, harp; Sal Ferreras, percussion; Eric Hominick, piano; Cyrena Huang, cello; Marliss MacAuley, flute; and Stephen Smith, piano.